So as mentioned in the last post, the student strike last week included a demand for Hong Kong’s Chief Executive, Leung Chun-ying (梁振英), to meet with them. 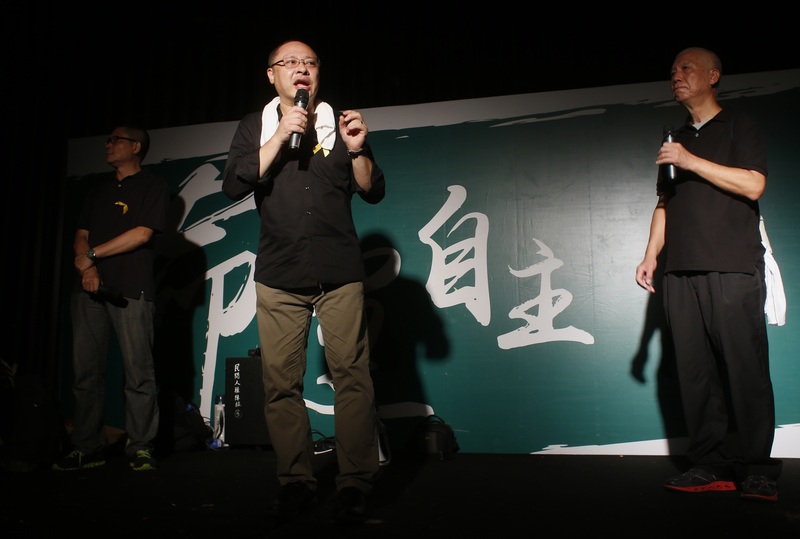 In his election (the 2012 race included a pro-democracy candidate, Albert Ho (何俊仁)), Leung had promised to listen to the people with a pen and paper in hand. Students were furious that instead, he drove off without so much as a backwards look. On Friday, a group of protesters set up outside the government headquarters at an area known as Civic Square. This area is a small public court that has been used in past protests, but earlier this year fences were put up to block public access to the square. A group of 50 to 100 protesters climbed over the fences and into the square by Friday night. Once inside, they sat peacefully waiting to be arrested while the police surrounded them with barricades and did arrested a good number of them. Several students leaders, including Joshua Wong (who helped found and lead Scholarism (學民思潮), which spearheaded the 2012 protests against National Education) and Federation of Students leaders Lester Shum and Alex Chow Yong-kang were arrested and only released by Sunday night. Finally the Occupy leaders arrived at about 10am on Saturday, but they refused to launch the movement earlier than scheduled. The plan was to begin the movement on October 1, National Day, which celebrates the founding of the People’s Republic of China. But just hours after Occupy leaders made this statement, at 1:45am on Sunday, Benny Tai (戴耀廷) declared that Occupy Central would, indeed, start now. Why are we here tonight? I would rather be sleeping tonight. Why are we here tonight? We are here to tell our Chinese leaders… “One country, two systems” is not good just for Hong Kong, but for the rest of China. If we can keep our core values, then China can catch up with us in 50 years. For 50 years we could influence China with Hong Kong’s core values, and if that is not enough we could spend 50 more. This was the proposal by Deng Xiaoping. Unfortunately our current leaders have no courage, no vision to support “One country, two systems”…. We want the real version, the genuine version of 1 country 2 systems…. China breached the Joint Declaration; “one country, two systems” never existed…. I hope China’s leaders could understand us. We love the country and love Hong Kong. 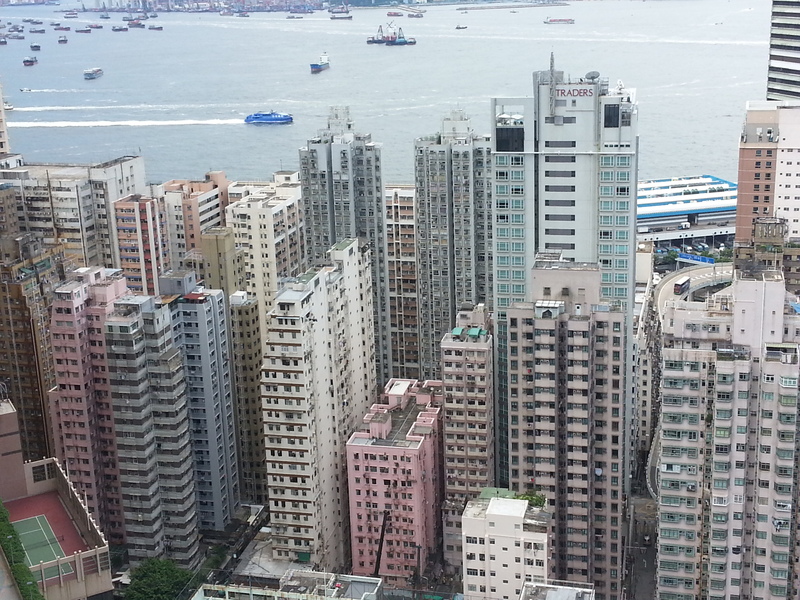 What good is it to China if Hong Kong is just another Chinese city? It was hard to sleep, with Twitter updating faster than I could think and a live feed of the massive crowd swarming Tin Mei Avenue outside the Legislative Council Complex near the Admiralty MTR. 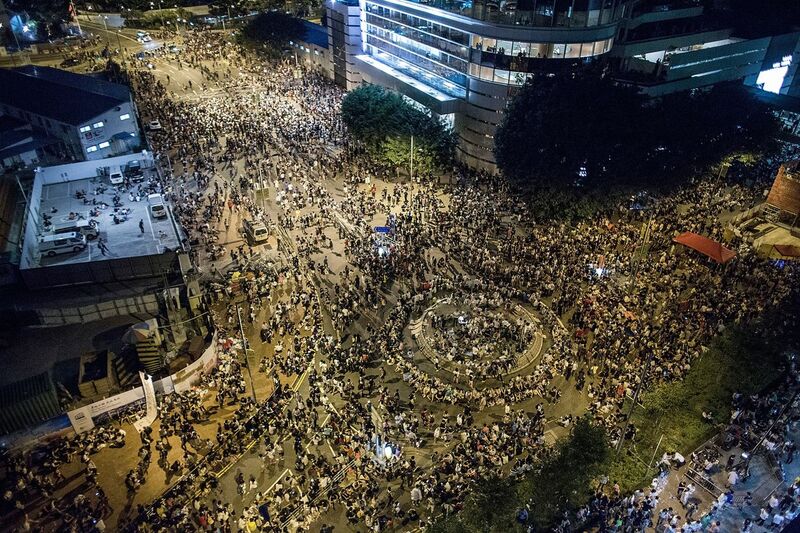 On Sunday I made plans with a few people to go to the protests at Admiralty together. As I walked down the street I remembered it was Sunday – the day that most foreign domestic workers have off! So I caught a bus down to Statue Square in Central to see if there was any impact on their weekly ritual because of Occupy Central. And aside from there seeming to be fewer people out on the streets, there was generally no effect. On Chater Road, where APMM had held its anniversary celebration, there was a series of yellow tents and a stage set up for something called “Kaliland Minandao.” Colorful dances on the stage suggested that the event was a cultural celebration of the Filipino island of Minandao. I ran into Libby from APMM and she said that if I hadn’t told her, she would never have known that Occupy Central had started; the area around Statue Square was so undisturbed. We chatted for a bit then I left to see if I could check out the pro-Beijing event at Tamar Park before continuing down to the protests in Admiralty. Access to Tamar Park is a bit hard from the ground – you need to get onto one of the raised walkways to hit the main entrance, and side entrances that are reachable from the ground were too far. Yet the stairways leading up to the walkways were all closed off, and the police wouldn’t let me up. Trying to find a way around to another staircase, I ended up walking along Connaught Road and into the protests at Admiralty. 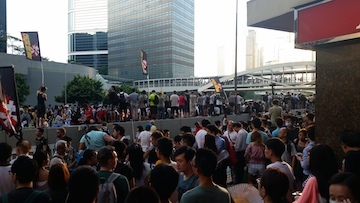 A man on a small stage was rallying the rather small, loosely packed crowd, and I passed through pretty easily and went up to a raised walkway attached to the United Centre (統一中心) to watch the scene from a safe distance. Every inch of the walkway was packed with workers sitting on cardboard, playing cards, eating, making beaded handicrafts, and watching – or ignoring – the growing crowd of Chinese. I stopped to chat with a group of women and asked what they thought about the situation. “Oh, we like to watch the students fight the police,” one woman said. They supported them, the women explained, because if they didn’t have democracy, then things would be worse, and Hong Kong would go [she made a downward movement, like an airplane dropping from the sky]. As Peter and I stood and watched, the crowd grew from a small group to a massive gathering that swarmed the entirety of Rodney Street. Several students set up a first aid station underneath the walkway and began setting up water, napkins, and other supplies. One man walked by and began to yell at the crowd, criticizing them for gathering – I couldn’t hear the exact words – and tens of people began to shout back at him, pointing fingers and booing. Several people began to gather around the man, and one woman seemed to be poking at him with her umbrella – and then three or four young men leapt in and stood between the man and the others, preventing any further altercations, and the man eventually left. I couldn’t exactly see what was happening on the other side of Connaught Road, but people around me were excitedly saying that people on the other side of the road were crossing over the police barricades to reach our side. And it seemed to be the case – though traffic had been moving when I first arrived, by about 3 or 4pm buses seemed to be backtracking or simply stuck in the growing swarm of people. “好!” the people around me said, proud of the protesters for taking back the streets. 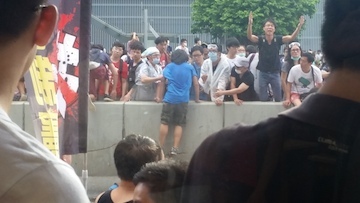 People began to climb over cars and barricades to fill Connaught Road [video here]. I could see a police presence along the road, but they did not stop the protesters. People on the ground began to yell up to us on the raised walkway. “有遮俾遮!” (“If you have an umbrella, give it to us!”) The protesters were using umbrellas as shields against pepper spray on the front lines. People around me began to open their umbrellas and toss them down, gently floating into the waiting hands below. Protesters at the front of the lines turned the umbrellas inside-out so that when they were sprayed, the residue wouldn’t hit or drip onto their neighbors but instead gather on the ground. At this point Peter was pretty hungry, and so we left to find a restaurant to grab a bite and possibly watch the street from the windows. Heading back indoors along the walkway, we could see the police barricade blocking access to the overpass on Connaught Road. On the ground floor of the Admiralty Center (海富中心) we found a KFC facing Connaught Road and sat down there. Banners on the street from People Power read “共” with a huge diagonal X-ing out the word for the Communist Party. Falun Gong had apparently placed another banner on the street, also anti-CCP. This is all I can post for now – I’ve got to grab lunch, but check back soon! From KFC we had a ground-floor view of Connaught Road. People on the streets were yelling at spectators on the sidewalks to join in, and helping those who did scale the tall police barricades. A few young men began dismantling some water-filled police barricades and stacking them up to create a makeshift staircase for people to get across. Police in helmets and riot gear passed by the KFC windows and through the crowd of spectators with no incident, other than a lot of picture-snapping. The crowd was massive at this point, and after we finished eating we went outside to take a look. People were standing on the barricades, filling Connaught Road as far as we could see. One of the main walkways leading to Tamar Park was completely blocked off by police, who only allowed those with media passes to enter. 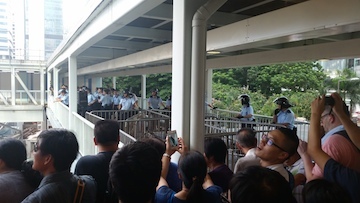 On the other side of Connaught Road we could see the stairs leading down from the walkway, which was being used by police to monitor the situation. The crowd seemed to be swelling in force and numbers, and we couldn’t see exactly what was happening in the front lines, but it seemed like protesters were clashing with the police. Peter and I, who’d also run into Aaron, decided it was time to go inside. From two large stairwells within the Admiralty Center we could see the street below. We stood watching and talking with the other spectators inside, when suddenly – pop! Curling streams of grey smoke whizzed over the crowd, and an uproar of disbelief and rage burst out from every direction. The police were using tear gas. We felt incredulous. We’d been talking about what might happen – rumors, gossip, fears – but seeing the police take such aggressive action against a crowd – a huge mass of people that outnumbered the police force, but a peaceful mass – and one that we were sure would have dispersed peacefully of its own accord by nighttime – it was mad. The protesters cleared off the streets as best they could to avoid the plumes of smoke. But then they returned in larger numbers, crowding back against the police. Several more rounds of tear gas were fired, and each time the street emptied for several minutes before filling up again. In the stairwells, people expressed their anger. One man said the last time the police had used tear gas was against the pro-Communist rioters in 1967, who – far from being peaceful organizers, like these – were actually setting off bombs in Hong Kong (the man’s recollection was wrong; Hong Kong police most recently used tear gas against South Korean protesters during the anti-WTO protests in 2005). Another was immensely proud of the protesters. These are real Hong Kong kids, he said in Cantonese, and if we don’t come out for them, who will? Will the gweilo (鬼佬), the foreigners (外地人) love them when they emigrate? These kids are staying here. No, we love them. And yet it felt so wrong to see protesters fighting the police in this way. Numerous reports state that protesters have yelled at them, “You are Hong Kong people too.” Peter mentioned that one of his friends was a police officer, and that he actually supported the protesters’ goals – but what could he do? This was his job. Peter had to leave after a while, so Aaron and I stayed. Aaron was a bit restless, and he wanted to go down and get a different view, perhaps find another walkway to watch from. So we exited the building and turned to the open-air entrance to Admiralty MTR facing Connaught Road – bad decision (though I have a nice photo for y’all, see?). 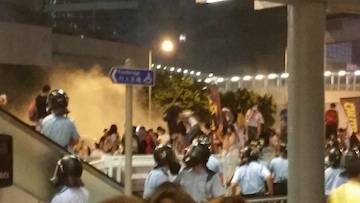 The tear gas was for the most part dispersed, but the wind had picked it up and drifted it into the station. It hurt. My eyes stung, my lungs burned, my face stung, and I closed my eyes and held my breath until the coughs couldn’t stay down. We pushed back into the station, where people had set up another first aid station and were offering teardrops and water to wash out our eyes. Luckily we hadn’t been hit too strong – I can’t imagine how much strength it must have taken those people who kept going back for more – and within a few minutes we were cleared up, though my cheeks still stung. Things seemed to be calming down on the street. It seemed both the protesters and the police were catching a rest. Libby and Beth went one way and Aaron and I went the other. Regular service to Admiralty had been shut down, so we all were walking to our destinations. Photos were circulating on Twitter that the police were using the MTR to send reinforcements, and Patrick sent me a photo from Jordan MTR. 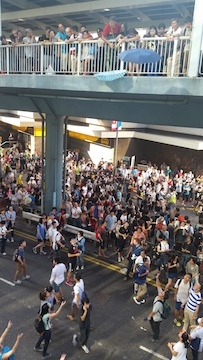 As we passed by the entrances to Admiralty MTR, we saw crowds cheering as young men blockaded the openings with gates, barricades, wooden planks, and trash cans to prevent the police from exiting the station. Farther down on Connaught Road, people were removing police barricades that had been erected earlier, so that in case more tear gas was fired, people could flee without being stopped by the gates. Human ingenuity! Aaron and I had a very intense debate as he walked with me to the Sheung Wan MTR – but that is a topic for another time. If you’re on social media, check out the great artwork that’s coming out of the movement, now being hailed as the Umbrella Revolution. For a general overview of the events, check here and here. Thank you for this uncensored look at what is happening in HongKong.